DISHA is a partner of Digital Empowerment Foundation. It is grassroot NGO based in Bhadrak Block, Bhadrak District, Odisha. The area covers 439 villages, 78 Gram Panchayats and 7 Blocks. DISHA started as a small school for the deprived children. In future they expanded their horizon and started many other programmes. They partnered with Digital Empowerment Foundation to empower women and youth in ICT and tailoring skills. 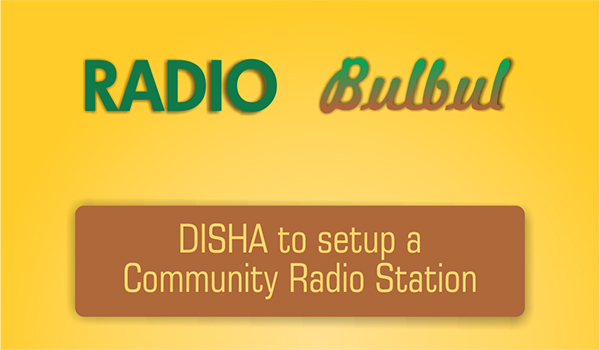 Seeking help from Digital Empowerment Foundation DISHA is now all set to start a community Radio station. The organisation has already been allotted frequency (91.2) for their Community Radio station. The Radio station will be called Radio Bulbul. The station will be based in Bhadrak Block; Bhadrak District and will have a radius of 15 kilometres. The Community radio station will be functional within the next six months. The main focus of the station will be to make people of he area more aware about Agriculture and commerce. Almost 49 percent of the population belongs to minorities .The community radio will also try to inform people about the plans and benefits that the government announces for the minorities in the country. As the area is very prone to cyclones the station also plans to give information regarding disaster management and awareness programmes. Community radio will be a new tool for the people in the area and make them more and better connected with the rest of the world.